Leading manufacturer of springs and precision components, Nottinghamshire based Advanex Europe Ltd, approached MecWash at MACH 2012 in its search for a company capable of cleaning part of its product range to a very high standard. Advanex Europe is the European Headquarters of the global Advanex Group which has more than 20 operations worldwide. Its products are used in a variety of sectors including aerospace, automotive, medical and military, and must be manufactured to meet the stringent requirements demanded by these industries. As many of its products must be completely free from all contaminants before they can be used, cleanliness is essential. However, as many of the products are extremely delicate it is also important that any post production cleaning process does not distort or damage them. 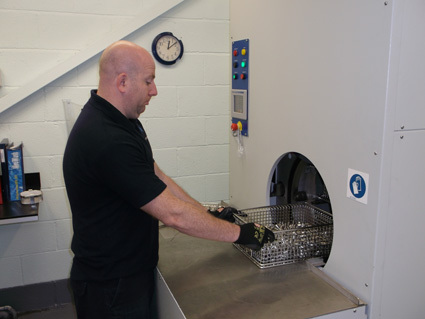 Following extensive trials at MecWash’s dedicated lab at its Tewkesbury HQ, the AVD 300 aqueous cleaning machine proved it was more than capable of meeting the company’s stringent cleanliness requirements. The AVD is a compact version of the proven Midi and Maxi component cleaning systems, specifically developed to meet the exacting standards of the aerospace and other industries where the manufacture of complex and intricate machined or pressed parts require the highest levels of cleaning and drying. Its compact footprint makes it suitable for small volume, high precision machining cells and its flexibility means it is equally suited to large components or dense baskets of small parts. The AVD removes all types of contamination such as soluble and mineral oils or greases, polishing compounds, lapping pastes and NDT dye penetrants from sensitive alloys. The system uses a number of processes including ultrasonic, flood and spray wash and rinse options, hot air and vacuum drying and variable speed rotation in both directions. MecWash employs a PhD Chemist to develop bespoke formulations of wash fluid to best meet the requirements of each individual customer. Managing Director, John Pattison, explains, “MecWash understands that all of our customers have their own specific requirements and objectives – we work closely with them throughout all stages of the project to ensure we achieve the best results possible, rather than offering a ‘one size fits all’ approach. Contact MecWash to find out more about its aqueous cleaning capabilities.